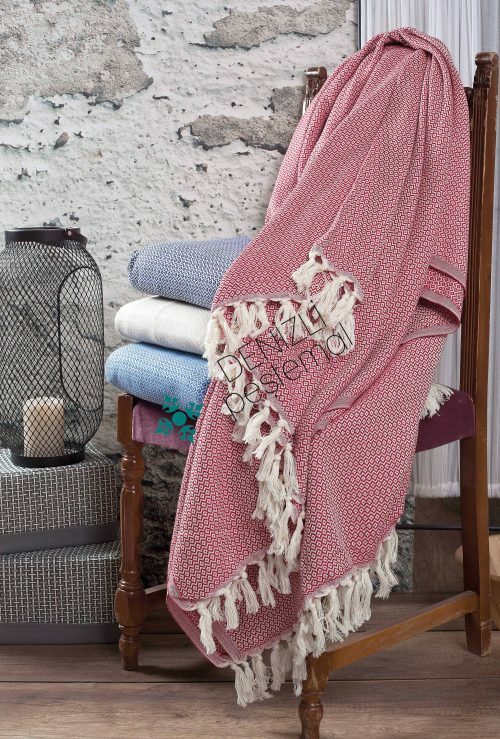 Piti diamond throws… They are woven 20/2 ring yarn and the colors are dyed regularly. These throws are soft, high-absorbance. These throws are mostly used in living rooms. Peshtemals have a very significant role in Turkish bath culture. They are even considerd as the symbol of Turkish bath culture. They are weaving fabrics used for covering people’s lower parts of the body during bathing. Peshtemals produced with silk are named as Fota Futa deriving from the language of Persia. Peshtemals have colorful striped patterns. They are made from either linen or sewing cotton. They also have fringes which make them more colorful and attractive. they are also used in different areas apart from hammams such as gardens, houses and bazaars and they are mainly used as aprons. Especially in the Black Sea region we can still encounter people wearing these peshtemals. Colors used in peshtemals are optional. While some people prefer colorful peshtemals others prefer one-colored ones. Our company has a role both in the production and selling of turkish towels. We have a very large scale of producing and selling of peshtemals and we only market for peshtemals that we specially designed for hammmams. Our wholesale for the peshtemals is an advantage especially for the businesses of hammams. Turkish baths are lack in number in these days compared to the past. Currently, we see that there are baths at hotels and gyms, but they are designed in a modern way. So, people prefer wearing beach towels instead of peshtemals. Beach towels are also appropriate for bathing in hammams, yet it will be more effective to encourage the use of peshtemals in hammams to keep our culture alive. By producing much more modern turkish towels, our company provides an easy way to adapt people to the trend of turkish towels. You can also communicate us about both wholesale and retail opportunities and ask for about our services.